The new knowledge articles in Microsoft Dynamics 365 enable you to create rich knowledge articles along with versioning and translation support. When you create and publish a knowledge article, it become available to users in your Dynamics 365 instance so that they can use information in the articles to effectively service the customers. Use the KnowledgeArticle entity to store and manage knowledge natively in Dynamics 365. If you’re using knowledge from Parature, use the KnowledgeBaseRecord entity to programmatically use the knowledge base articles from Parature. This topic provides information about working with the new native Dynamics 365 knowledge management capabilities. If you use Parature as your knowledge source in Dynamics 365, see Use Parature knowledge in Dynamics 365. 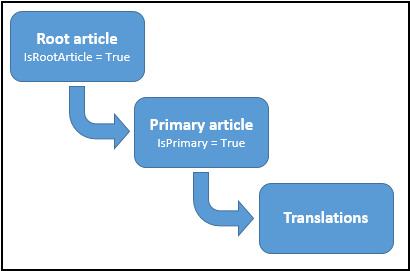 If you’re using the earlier knowledge base article (KBArticle) entity model, see Work with earlier Dynamics 365 knowledge base articles later in this topic. When you create a knowledge article record, Dynamics 365 internally creates a root article for the record. The root article acts as a container for the primary knowledge article created by you along with all the article versions and translations that you might create in future. The following diagram depicts the entity model for the KnowledgeArticle entity. When you create a knowledge article record, it’s created in the Draft state. Using the new KnowledgeArticle entity, you can create an article by specifying its contents and formatting in the HTML format as compared to using the old KbArticle entity where you had to associate it with a template that described the sections and formatting for the article. You can specify your own value for the KnowledgeArticle.ArticlePublicNumber attribute while creating a knowledge article record programmatically; otherwise, the value is automatically generated based on the format you specified in the Dynamics 365 settings area in the web client. The KnowledgeArticle.ArticlePublicNumber attribute stores the ID exposed to customers, partners, and other external users to reference and look up knowledge articles, and remains the same across knowledge article versions and translations. Content = "<p>This is the article content.</p>"
KnowledgeArticle.RootArticleId attribute to maintain the association with the root knowledge article record. KnowledgeArticle.PreviousArticleContentId attribute to point to the previous version of the record. The following sample code shows how to create a major version of a knowledge article record using CreateKnowledgeArticleVersionRequest. Using CreateKnowledgeArticleTranslation Action (Web API) or CreateKnowledgeArticleTranslationRequest (organization service) creates a new knowledge article record with the title, content, description and keywords copied from the source record to the new record, and the language of the new record set to the one you specified in the request. You also need to specify whether the new record will be a major or minor version. The new record uses the KnowledgeArticle.ParentArticleContentId attribute to maintain the association with the primary knowledge article record. After you execute this message and get a response, retrieve the knowledge article record from the response object, and then update the title, content, description, and keywords to add the translated content. The GUID value of the primary key (LanguageLocaleId) for each language record in the LanguageLocale entity is the same across all Dynamics 365 organizations. To change the state of the article, use the Update message on the knowledge article record to update the KnowledgeArticle.StateCode attribute. For early bound types, use the KnowledgeArticleState enumeration to set the possible states. More information: Perform specialized operations using Update. The following sample code shows how to publish a knowledge article record. When you enable embedded knowledge search for an entity in Dynamics 365 using the web client, a many-to-many relationship, msdyn_<Entity_Name>_knowledgearticle, is automatically created. You can use this relationship to programmatically associate or link a KnowledgeArticle instance with a Dynamics 365 entity instance. When you associate a KnowledgeArticle instance with an entity instance, a record for the relationship is created in an intersect entity called msdyn_<Entity_Name>_knowledgearticle. For example, when you associate a KnowledgeArticle instance with an Account instance for the first time, an intersect entity called msdyn_account_knowledgearticle is created, and a record with the association mapping is created in this intersect entity. By default, the Incident (Case) entity is enabled for the embedded knowledge search, and when you link a KnowledgeArticle record to an Incident record, an association record is created in the KnowledgeArticleIncident intersect entity. // knowledge article record to be associated. // Step 2: Create an object that defines the relationship between knowledge article record and account record. // record and account record. // Step 3: Associate the knowledge article record with the account record. Use the IncrementKnowledgeArticleViewCountRequest message to increment the view count of a knowledge article record for a given day in the KnowledgeArticleViews entity. If a record doesn’t exist for a knowledge article for a specified day, it will create a record and then set the specified view count value in the KnowledgeArticleViews.KnowledgeArticleView attribute. If a record already exists for a knowledge article for the specified day, it will just increment the view count in the KnowledgeArticleViews.KnowledgeArticleView attribute of the existing record. Knowledge articles in Dynamics 365, including their versions and translations, are full-text indexed and support SQL Server full-text search. For more information about full-text search, see SQL Server: Full-text Search. Use the FullTextSearchKnowledgeArticleRequest message to search knowledge article from your applications to find the information you are looking for. The FullTextSearchKnowledgeArticleRequest message lets you use inflectional stem matching (allows for a different tense or inflection to be substituted for the search text) and specify query criteria (using FetchXML or QueryExpression to specify filtering, ordering, sorting, and paging) to find knowledge articles with specified text. You can also choose to remove multiple versions of the same articles in the search results and filter on the knowledge article state while searching for a text. This section provides you with information about working with the earlier knowledge base article entity model for knowledge management in Dynamics 365. While the entities mentioned in this section are still available in the current version, you should use the knowledge management entities mentioned earlier to take advantage of the enhanced knowledge management experience. To change the state of the article, use the SetStateRequest message. For early bound types, use the KbArticleState enumeration to set the possible states. When you create an article, you have to associate it with a template and a subject. An article template describes the sections and formatting for the article. Subjects are used to organize the articles by business categories that are also used to group cases (incidents), sales literature, and products. A best practice is to create a subject tree hierarchy and all necessary article templates before you create an article. Microsoft Dynamics 365 provides several article templates. They include a standard article, a solution to a problem, a procedure, and other templates. The recommended method of creating article templates is by using the Microsoft Dynamics 365 web application. If you want to create an article template programmatically, use existing article templates as examples of what information to include and how to format the data. To associate an article with a template, use the KbArticle.KbArticleTemplateId attribute. To place an article in a specific category by specifying a subject, use the KbArticle.SubjectId attribute. Specify the title of the article and the keywords that you want to use in the search. To describe an article you can use the KbArticle.Description attribute. To add the content for the article, use the KbArticle.Content attribute. Use the Kbarticle.ArticleXml attribute to add the XML data for article. The KbArticle.LanguageCode value is obtained from the template to help you write the queries that sort the articles by the language. An unpublished article obtains the format settings from a template. If you change a template format, the changes are automatically propagated to articles in the “Draft” and “Unapproved” states. After you publish an article, you can add comments (KbArticleComment), but you can’t edit it, regardless of your privileges. The comments can be added to the article that is in any of the states. The comments can be added to the article in any state: Draft, Unapproved or Published. To revise or update the article, you have to unpublish it. To unpublish an article, change the state of the article from Published to Unapproved. To delete an article from the Microsoft Dynamics 365 database, change the state of the article from Published to Unapproved or Draft. A knowledge base article cannot be deleted, if it is in the Published state. For more information on creating, updating, editing, and locating an article in the knowledge base, see Help & Training: Use articles in the knowledge base.